Bazyar, M., Bonyad, A., Babaie Kafaki, S. (2013). Study of most element of forest destruction by used the IRS-1C and LANDSAT image in the southern zagros forest (Case study: Kohkeloeye and Boveirahmad province). International Journal of Advanced Biological and Biomedical Research, 1(1), 35-44. Mozhgan Bazyar; Abdolaslam Bonyad; Sasan Babaie Kafaki. "Study of most element of forest destruction by used the IRS-1C and LANDSAT image in the southern zagros forest (Case study: Kohkeloeye and Boveirahmad province)". 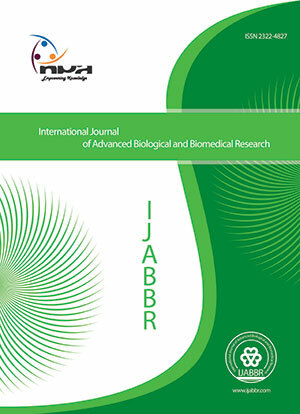 International Journal of Advanced Biological and Biomedical Research, 1, 1, 2013, 35-44. Bazyar, M., Bonyad, A., Babaie Kafaki, S. (2013). 'Study of most element of forest destruction by used the IRS-1C and LANDSAT image in the southern zagros forest (Case study: Kohkeloeye and Boveirahmad province)', International Journal of Advanced Biological and Biomedical Research, 1(1), pp. 35-44. Bazyar, M., Bonyad, A., Babaie Kafaki, S. Study of most element of forest destruction by used the IRS-1C and LANDSAT image in the southern zagros forest (Case study: Kohkeloeye and Boveirahmad province). International Journal of Advanced Biological and Biomedical Research, 2013; 1(1): 35-44. The Zagros forests (west of Iran) have been highly exploited in recent decades by human impacts. Easy access, abundance and variety of valuable forest yields have led to population growth density, creation of new residential areas and deforestation activities. In order to determinate the distribution and rate of deforestation from 1995 to 2006 by using the satellite imagery (IRS-1C and LANDSAT image) and possibility of modeling the changes extent and its relation to physiographic and some human factors by using multiple regression in the Kohkeloeye and Boveirahmad province, Golestan province. Southern Zagros forest, west of Iran. Classification was performed using maximum likelihood classifiers and forest divided two classes (forest and non – forest). Results showed that the maximum likelihood classifiers exhibited the highest results with 96% overall accuracy and 74% kappa coefficient. The results showed that about 462.5 ha from forest areas were deforested in the 12 years. To determination of major element of forest destruction used the multiple regression methods. According to results distance from road and village variables were in contrary of deforestation expanding. Forest destruction was increased with increasing around populated villages and near of this village. Amini M. R, Shataee Joybari S, Moaieri M.H, Ghazanfari H, 2009. Deforestation modeling and investigation on related physiographic and human factors using satellite images and GIS (Case study: Armerdeh forests of Baneh), Iranian Journal of Forest and Poplar Research, 16(3): 420-433. Andrés V, Fernando R, Rundquist C, 2004. Satellite Change Detection Analysis of Deforestation Rates and Patterns along the Colombia – Ecuador Border, a Journal of the Human Environment, 33(3):118-125. Chakraborty K., 2009. Vegetation change detection in Barak Basin, CURRENT SCIENCE, 96(9): 1236-1242. Fattahi M, 1994. Study on Zagros oak forests and the most important their destruction causes. Institute of Forests and Rangelands Research press, Sanandaj, Iran. Fathizadeh O, Attarod P, Pypker TG, Darvishsefat A.A, Zahedi Amiri G,2012. Seasonal Variability of Rainfall Interception and Canopy Storage Capacity under Individual oak (Quercus brantii) Trees of Western Iran. Journal of Agricultural Science and Technology 15. Forest and Rangeland Organization of Iran, 2002. Strategies for sustainable forest management in Zagros forests, Technical Report, Forest and Rangeland Organization, Teheran, Iran, 70 p.
Ghanbari F, Shataee Sh, 2011. Investigation on Forest Extend Changes Using Aerial Photos and ASTER Imagery (Case Study: Border Forests in South and Southwest of Gorgan City), J. of Wood & Forest Science and Technology, 17(4), 1-18. Haidari M, Shabanian N, Haidari R.H, Bazyar M, 2012. Structural diversity of oak forests in Kurdistan Province (Case study: Oak forest), IOSR Journal of Pharmacy and Biological Sciences (IOSR-JPBS), 4(3): 37-43. Haidari M, Jalilvand H, Haidari R.H, Shabanian N, 2012. Study of Plant Biodiversity in Grazed and Non-grazed Areas in the Iran-o-Turanian Ecological Zones (Case Study: Yazd Province, IRAN), Annals of Biological Research, 3 (11):5019-5027. Hosseini S.A. O, Haidari M, Shabanian N, Haidari R.H, Fathizadeh O, 2012. The impact of single selection method logging on the tree and shrub diversity in the Hyrcanian forests, European Journal of Experimental Biology, 2 (6):2229-2237. Haidari M, Namiranian M, Gahramani L, Zobeiri M, Shabanian N, 2013. Study of vertical and horizontal forest structure in Northern Zagros Forest (Case study: West of Iran, Oak forest), European Journal of Experimental Biology, 3(1):268-278. Jazirehi MH, Rostaghi EM, 2002. Silviculture in Zagros, University of Tehran Press, Tehran, Iran, 560p. Marvi-Mohajer MM, 2005. Silviculture, Tehran University Press, Tehran, Iran. Miettinen J, Shi C, Liew S.C, 2011. Two decades of destruction in Southeast Asia's peat swamp forests, Frontiers in Ecology and the Environment, 10: 124–128. Rafyayan O, Darvishsefat A.A, Namiranian M, 2006. Investigation on Forest Extend Changes in the 1995 to 2002 in hyrcanian forest, J of agriculture and natural resources, 10(3): 277-288. Sussman w, Green M, Sussman K, 1994. Satellite imagery, human ecology, anthropology, and deforestation in Madagascar, Human Ecology, 22(3): 333-354. Tree Society, 2000. Impact of Deforestation. Johannesburg: Tree Society, Who's Trees? A People's View of Forestry Aid. London: Panos Institute.